Garry Monk shakes the hand of chairman Huw Jenkins after he was confirmed as Swansea City’s permanent manager. 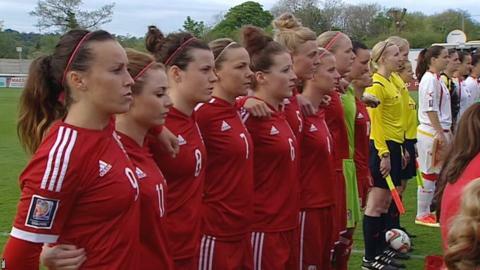 Wales players line-up before their 2015 FIFA Women’s World Cup Qualifier against Montenegro in Bangor, which they won 4-0. 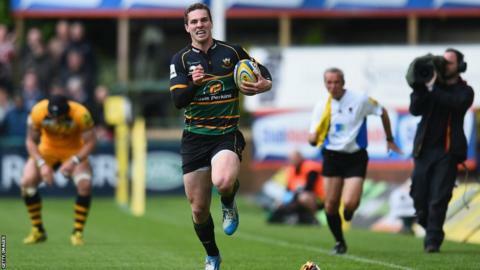 Wales wing George North breaks to score one of two tries during Northampton Saints’ 74-13 thrashing of London Wasps in the Aviva Premiership. 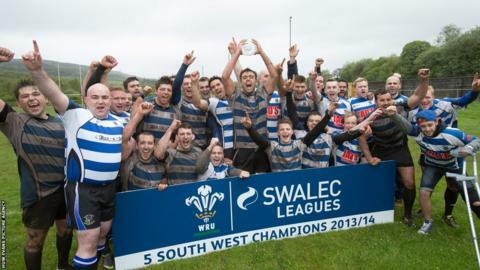 Ystradgynlais RFC players celebrate winning the SWALEC Division 5 South West title. 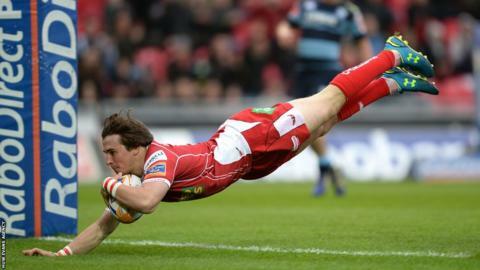 Adam Thomas is tackled during Wales’ pool match against New Zealand in the London leg of the IRB Sevens World Series at Twickenham. 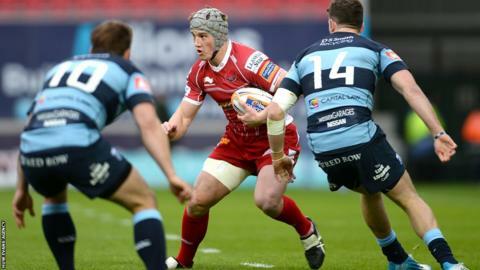 The All Blacks won 49-0 and Wales finished bottom of Pool A.
Dragons centre Pat Leach is tackled by Treviso’s Ludovico Nitoglia in the final Pro12 game of the season at Rodney Parade. 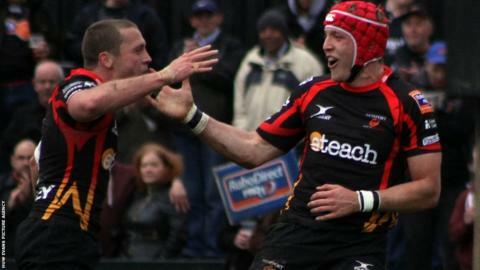 Tyler Morgan celebrates with team-mate Richie Rees after scoring Dragons' first try against Treviso. 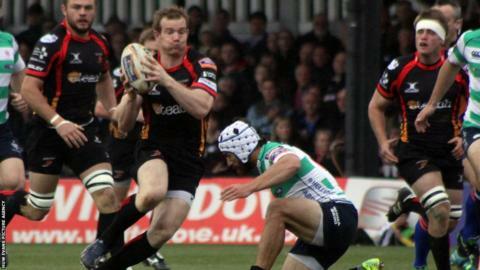 Fly-half Jason Tovey adds a conversion during Dragon's narrow 20-19 win over Treviso at Rodney Parade. 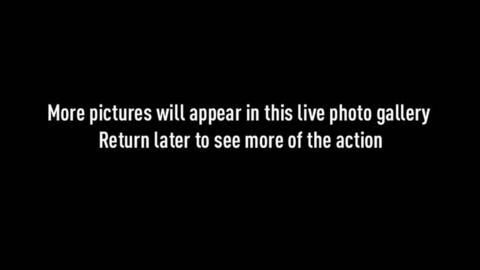 Chelsea’s Eden Hazard takes on Mats Moller Daehli against a backdrop of protest from Cardiff City fans against owner Vincent Tan. 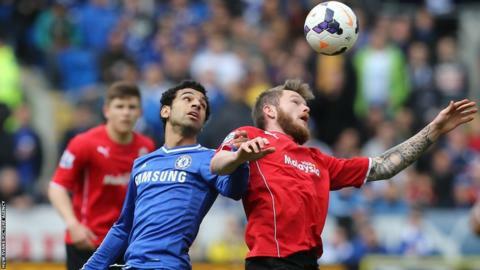 Chelsea winger Mohamed Salah battles for the ball with Cardiff City midfielder Aron Gunnarsson on the final day of the Premier League season at Cardiff City Stadium. 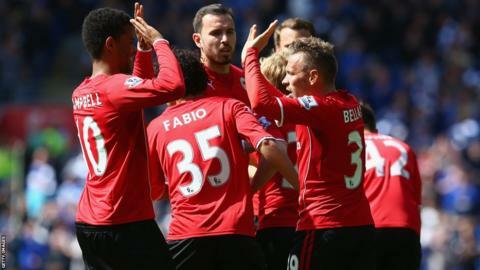 Craig Bellamy celebrates with his Cardiff City team-mates after giving his side the lead against Chelsea. 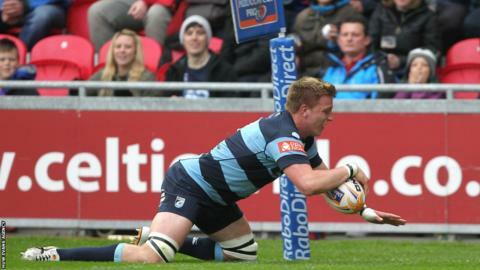 Steven Caulker gets above Chelsea goalscorer Andre Schurrle during already relegated Cardiff City’s 2-1 home defeat on the final day of the Premier League season. 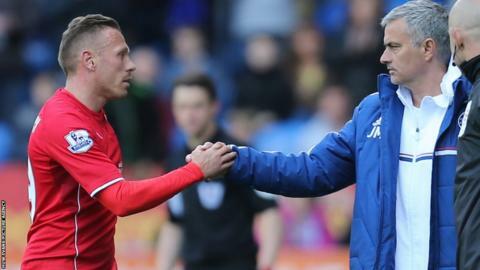 Craig Bellamy shakes the hand of Chelsea manager Jose Mourinho as he leaves the Cardiff City Stadium pitch. 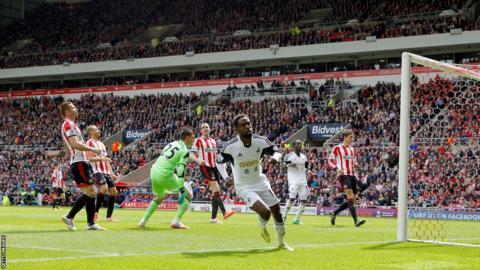 Swansea City winger Nathan Dyer gets ready to celebrate after giving his side a seventh minute lead away to Sunderland in their last game of the Premier League season. 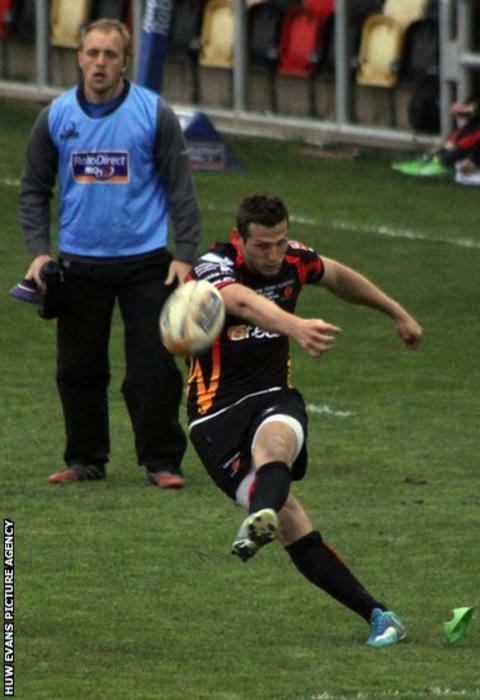 Jay Fulton, making his first start for Swansea City, gets stuck in with Sunderland’s Adam Johnson. 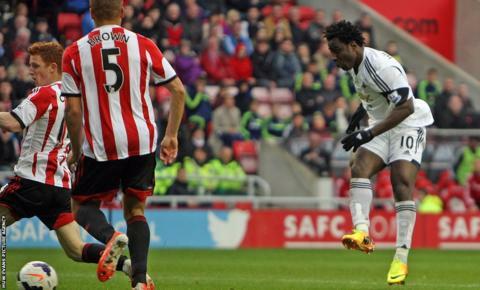 Swansea City top-scorer Wilfried Bony scores his side's third goal at the Stadium of Light. 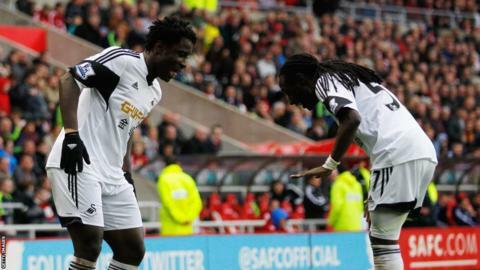 Bony celebrates his goal with fellow goalscorer Marvin Emnes as Swansea end the season with a 3-1 win. Aaron Ramsey scores with a spectacular volley to give Arsenal the lead against Norwich City at Carrow Road.